Concordia Publishing House is pleased to announce the release of Ephesians, the twenty-eighth volume in the landmark Concordia Commentary series. Written by Dr. Thomas Winger, this volume is a veritable compendium of St. Paul’s theology. Dr. Winger’s commentary unfolds the mysteries of the Gospel through meticulous analysis of the Greek text and reverent exposition of the epistle’s proclamation of Christ and His gifts for the sake of the Church. 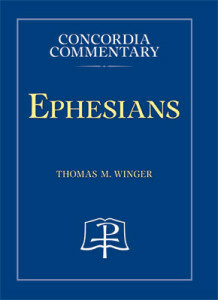 Winger’s commentary addresses such timeless topics as our eternal election in Christ; salvation by grace through faith apart from works; one Lord, one faith, one Baptism; the gift of the Holy Ministry; the Christological meaning of marriage; and the resplendent armor of God, which we so desperately require in this time of spiritual peril. You can order Ephesians now at cph.org. Or subscribe to the entire series here. Read part 1 of an excerpt from the commentary here, part 2 here, and part 3 here. Thomas M. Winger is president of and professor at Concordia Lutheran Theological Seminary, Saint Catharines, Ontario, Canada. Dr. Winger is the author of dozens of articles, many published in Lutheran Theological Review; the (co)editor of three books; and a contributor to The Lutheran Study Bible. Birthed in the Lutheran tradition and nurtured in historical and linguistic scholarship, the Concordia Commentary series takes seriously the Word of God for the church today. Each volume in the series is designed to enable professors, pastors, and teachers of the Word to proclaim the Gospel with greater insight, clarity, and faithfulness to the divine intent of the biblical text.